I've mentioned many times in passing that it's very important to us that our children experience intentional holidays - we want them to know that there are others in our community who do not experience the holidays in the same manner that they are blessed to, that the holidays are more about giving than receiving and to understand the value and gift that is one's time. 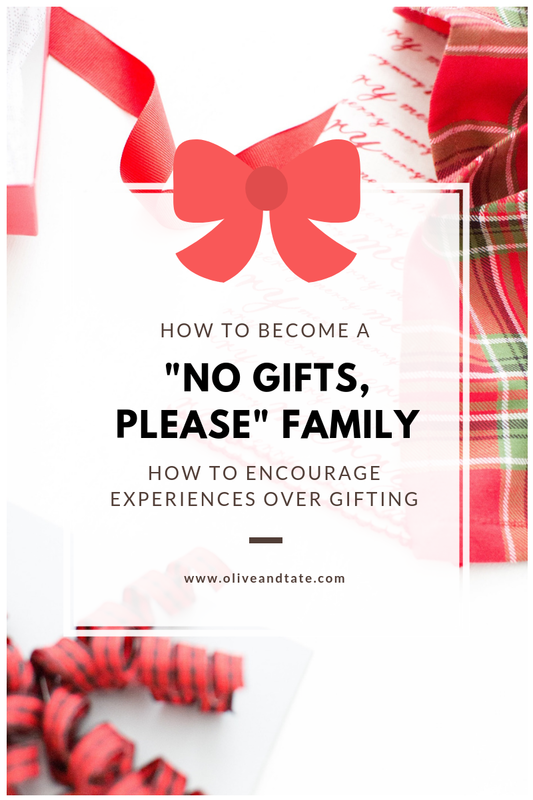 While we have many traditions that help us accomplish this (including leaving Santa Sacks on Christmas Eve, helping to bake home made cinnamon buns for our friends and neighbors and making gifts for their teachers), one of our main missions is to ensure that we are a "No Gifts, Please" family. That's right, we ask that our friends and families kindly refrain from gifting our kids on holidays and their birthdays. Before anyone gets upset, we as parents of course give them gifts on their birthday and for Christmas, but we are very thoughtful in what we gift them and how much "stuff" we allow to accumulate. I recently mentioned that we ask even the grandparents to avoid giving them gifts and instead ask that they be given experiences or the gift of time and lots of questions came my way. I know it's hard to break tradition and stray from the norm, but, to be quite honest, my children are extremely blessed and need nothing. Not a thing. They have more toys and puzzles and dress up and LEGOS and art supplies than I can keep up with - what they need from their grandparents is time and attention. What could be a better gift than the option to spend time together making memories? We've never lived in the same town as any of the grandparents so we use our experiences while they are visiting or, if they give our kids an annual pass, we take pictures and send them to the grandparents every time we use our passes. I came up with a list of ideas that you could share as an experience gift, and the best ways to actually give them, and I think everyone will find something special on the list! We ask that our parents gift our children with passes to the local Children's Museum/Zoo etc of their choice each Christmas. Even the smallest town that we've ever lived in had a small Children's Museum and my kids love getting to visit regularly. As they grow (or we move), we've asked for more specific venues (like the Science museum or Nature museum) but annual passes are by far our favorite experience to receive. If an annual pass is not in the budget, I highly recommend that grandparents choose an experience local to you and plan a day-of adventure! Grandma and Grandpa can load up one or all of the grandkids and take them on a special outing to the Zoo, etc. It's all about the time spent together, and it doesn't have to take place in December. If Grandma and Grandpa aren't in to giving experiences with nothing to open on Christmas, have them wrap up a gift that represents the experience - for example, if they chose the zoo, have them purchase and gift an inexpensive zoo keeper's costume with the tickets included. They can explain that soon, they will go on an adventure to the zoo and until then, your little can play zoo keeper to prepare. How special would it be for Grandma or Grandpa (or Auntie or Uncle, etc) to teach your little the secret family cookie recipe? Or how to make Mommy's favorite dinner? My son is 4 and very into helping in the kitchen, baking and asking everyone if they loved what he made. An afternoon in the kitchen would make his day. In fact, when I was in high school, my grandmother taught me and my brother how to make our favorite Christmas cookies one year, and my brother still makes them religiously. Bonus that this experience can happen any time of year, just make sure it's special one on one time. If a gift has to happen, wrap up a pair of Mickey oven mitts and slide them under the tree. My children love photo books with their photos in them - and I think a Grandparent photo book would be an awesome gift. If grandparents are into taking pictures, then perfect, or mom and dad can send grandparents pictures throughout the year. We make our photo books in Chatbooks but if a true scrapbook is more your speed then go for it! This is the perfect gift that can be shipped if everyone is spread out across the country and is absolutely the gift of time. When I was little, we rode the train with my mom to visit her parents a few states away. I remember it very well, especially walking to the dining car. Family members can take a little on train ride, literally to the next stop, then turn around for the return trip, so your kiddo can experience a ride on a real train. This is especially perfect for little boys who are into all things automotive. When I was probably nine or ten, my grandmother took me to see Gone With The Wind in the theatre (it was running on a limited release). I remember her telling me that she saw Gone With The Wind when it was first released - something I couldn't imagine at the time. A date to the movies is something that we don't usually schedule with our kids, so I know it would be a special treat for our parents to take them. I encourage you to try a year of no gifts to see what happens, I bet the memories made will be worth shaking things up! Great post! I love memberships to places as gifts. We can take up to 6 kids every time we go so we bring friends and it's created so many great memories that I don't have to pick up off my floor and put away every night! Oh I hadn't thought about guest passes being included with memberships! That's such a great point! and yes to the not picking things up....ugh, no more toys! I really love this idea, I need to start searching for great places for the nieces to experience, instead of more stuff. Yes! You'll both love the memories, I promise! If we go somewhere super special, we'll turn the photos we take into a chatbook so that we can talk about later, it's the best. This is a wonderful post!! Great idea and you provide wonderful examples along with and make it easy to implement! Thanks!! Oh that's an amazing idea! Love!